This is an old children's Christmas poetry book that I found at the library...fantastic! Each animal has a poem about going to see the Christ Child...then the shepherds and kings come and sing their poems...the queens get there late, and the mother doesn't go at all, because she believes she is most needed at home with her own little one...it's touching and sweet and a great little story. 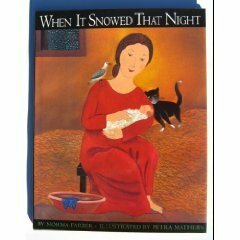 A lovely Christmas poem, with beautiful illustrations that I saw over the holidays and then bought a copy.